a place we fell in love with 10 years ago, vibrant, fun, colourful and oh so cool – it has a huge personality and we totally love it! we just so had to go for a first proper family holiday this summer … I was so inspired … here’s a little taster … mmm – when can we move? the new Pattern Observer collection! I am so thrilled one of my patterns has been chosen to be part of the new Pattern Observer collection for Keka Case! Check-out my Halloween trend post for Pattern Observer! Hope you like it. 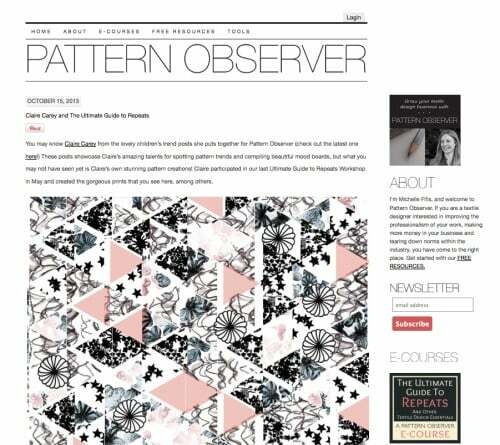 really exciting to see my work featured on the pattern observer blog talking about their great repeats course, The Ultimate Guide to Repeats. Here are my latest children’s trend boards for Pattern Observer; hope you like them.